Not surprisingly, the most commonly injured joint among circus artists is the shoulder. A study done on performers in Cirque du Soleil found that this was the case among acrobats, aerialists, and hand balancers; across genders and ages (see details here). Whether you’re a seasoned circus artist or brand new to the scene, there’s a good chance you’ve felt some aches and pains in your shoulder! 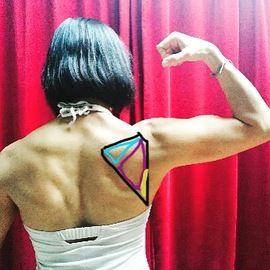 This post will discuss some basic shoulder anatomy, and why it’s relevant for circus artists!There are two general types of muscles that act on the shoulder- we can refer to them in broad terms as the “mover” muscles and the “stabilizer” muscles. “Movers” are the big muscles that tend to get all the glory- lats, traps, and pecs. Their purpose in the shoulder is to produce big and powerful movement, whether it’s bringing your arms up overhead or doing the grunt work involved in climbing up a 30 foot silk. “Stabilizer” muscles are the smaller muscles that act to fine tune shoulder movement and ensure optimal shoulder-to-shoulder blade alignment. In other words, they do the behind the scenes work to make sure that the movers can do their job without any issues. 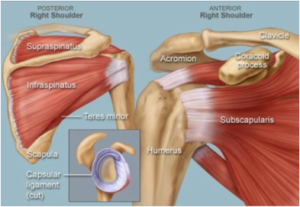 The major stabilizer muscles in the shoulder are the muscles that make up the rotator cuff. When these guys stop doing their job, no ones happy!There are four muscles that make up the rotator cuff: The supraspinatus, infraspinatus, teres minor, and subscapularis. All of these muscles originate on the scapula (shoulder blade) and attach on different parts of the humerus (the top of your shoulder). The role of these muscles in general is to keep the head of the humerus (the “ball” part of the “ball and socket” joint) positioned in the middle of the glenoid fossa (the socket) while your arm is moving in all positions, but especially overhead. Basically, they ensure optimal alignment and stability so that the big “mover” muscles can do their jobs without causing any pain. As you can imagine, if you’re doing a simple task like getting a glass from the top shelf, your rotator cuff doesn’t have to work TOO hard, and mild weakness probably won’t be a huge deal. 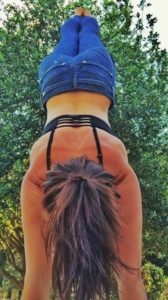 However, if you’re doing a meat hook, climbing a silk, or working on a one arm handstand, your rotator cuff BETTER be in top shape- the slightest weakness could cause some massive shoulder pain. If these muscles do get irritated or inhibited, you might get that pinchy, painful feeling on top of our shoulder when your arm is overhead. Now that we’ve covered the basics of rotator cuff anatomy, the next several posts will discuss practical applications, why it’s relevant to the circus artist, and some of my favorite rotator cuff strengthening exercises for injury prevention.​Questions? Comments? Concerns? Feel free to comment below!